We have recently seen an increase in customers wanting to bring a large selection of PST files into their MailStore archive. It’s quite common for people to create local PST file archives of their own email and historically this was a common way to reduce the data within the mailbox on their mail server. The problem we see is that over time many users build up multiple local PST files and as these are scattered around on various client machines it gets very difficult and costly to keep them all backed up. If you also consider in this scenario there is also no way for users to search each others archive it makes it very difficult to meet compliance requirements. MailStore is an excellent archiving solution for archiving multiple users mailboxes from a an email server like Microsoft Exchange or MDaemon, but what you might not know is that you can also import existing archives stored in other locations including PST files. 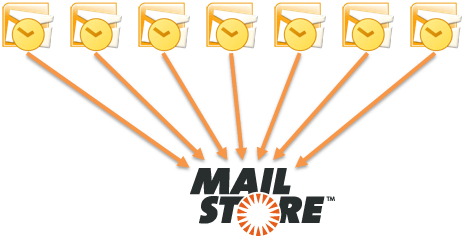 If you are working on a fresh installation of MailStore you would first setup jobs to archive new journal email and then the users mailboxes by following our setup guides here. Once the main archiving jobs have been created we can start bringing in the old user PST archives one by one. You can assign this job to the end users by installing the MailStore client application on each users PC but as this is generally a one time job it often makes more sense to gather up all the user PST files ( being careful to label them for each user accordingly) and setup specific archive jobs to pull these files into MailStore and store them under each relevant users archive. In MailStore this is a simple case of creating a new archive job and choosing the Outlook PST file profile. In this job you first select the PST to be archived then on the next page select the user archive that will contain the messages. Once you run this job two new folders ‘Outlook Inbox’ and ‘Outlook Sent Items’ will be created under this users archive containing all the data from the PST. 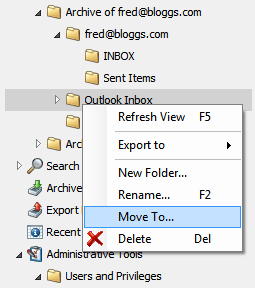 If you want to tidy this archive up a little you can actually merge this data with the existing archive by selecting the ‘Outlook Inbox’ folder right click and choose ‘move-to’ , then select the destination folder that contains the archive Inbox folder. MailStore will merge two folders that exist in the same location that have the same folder name. Sub folders will also be merged in this way if they match. There you have it, old users email that was stored in a PST file is now merged within MailStore for this user. You would now repeat this operation for each user but once complete you can safely delete the old PST files as they are no longer required.